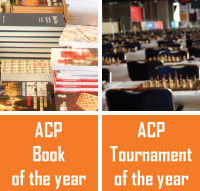 The ACP Tour is a unique system that unites more than 100 international chess tournaments annually all over the world.The main idea of the ACP Tour is to encompass the most important chess tournaments regardless of their format in a unified 12-month season. Participants in the events receive points according to the rating system developed by the ACP. Chess players who earn the highest number of points during the ACP Tour season are eligible to participate in the ACP Cup. The ACP Cup winner is declared the winner of the ACP season. Only the most significant international competitions and the strongest national leagues are involved in the ACP Tour. Players earn points only for their personal performance and team results are not counted. The number of games played and other factors are also taken into account. Similar models for determining the level of seasonal performances are successfully used in tennis and golf, but in chess the creation of a unified system has been hampered by the fact that the major tournaments vary considerably in format, and are performed with different time controls. The Association of Chess Professionals however managed to develop and implement a balanced system for computing the rankings, which received recognition among professionals and organizers. The first ACP-Tour started on 1 July 2004 and ended 30 June 2005. At the end of the 7th edition (2010-2011), the ACP Board decided to delay the 8th edition of the ACP Tour so that its season coincides with the beginning and the end of the calendar year. This will make it easier for organizers, participants and sponsors to plan their participation in the Tour, apart from streamlining administrative and organizational aspects of the ACP Cup.